Miro operations manager Peter Mackenzie. A group of north-east lifesavers have secured a massive funding boost in order to allow them to continue saving lives at sea. 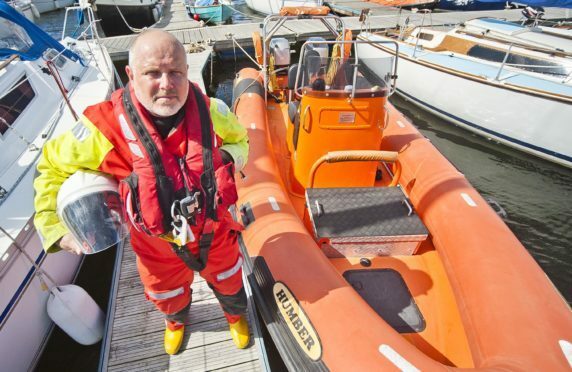 The Moray Inshore Rescue Organisation (Miro) has stood ready to assist with emergencies in Findhorn Bay or at sea for the past 12 years. Two vessels have served the Findhorn-based charity during that time. However, fears had been raised about mounting bills for the current craft, the Glyn Whitehead II, named after a sailor from the village who died at sea in 2003, to keep it seaworthy for the future. Yesterday, it was announced that the group has secured £27,000 from the UK Government’s Rescue Boat Grant Fund. The boost covers the outstanding amount needed by the team to place an order for a new £68,000 vessel. Miro chairman John Low, said: “We’ve been aware for some time that the current rescue boat would need replaced soon in order to maintain our vital 24-hour, 365-day search and rescue service. Miro expects to launch the new boat in Findhorn in the spring. The vessel is expected to be able to allow the charity to increase the crew able to attend emergencies from three to four members – allowing them to attend a bigger variety of calls. The group of about 30 volunteers, which includes a crew of 16, is responsible for emergency calls across a 20-mile stretch of coastline between Hopeman and Nairn. The UK Government’s Rescue Boat Grant helps water searches, rescues and recoveries across the country. Between March and November the Miro Inshore Rescue Organisation was called out 14 times. Rescues involved assisting sailors and kayakers who have got into difficulty with their boats as with their boats as well as animals in distress. However, in November the team was called to rescue swimmers who feared for their lives. One boy was almost swept out of the mouth of Findhorn Bay with the outgoing tide before he was able to hold onto a buoy. The Miro crew performed initial first aid on the youngster before establishing that further medical aid was not required. During August the charity was called out twice within the space of a week – firstly to a boat that had overturned in Findhorn Bay and then to help a vessel adrift off the coast of Nairn.